Oiling Your Hair the Right Way! Beautiful, thick and healthy hair is the most precious ornament that every woman loves to wear. There is a lot of hard work that goes into accomplishing that beautiful hair, and if it surprises you, oiling it the right way is one of them!. Using the right kind of oil and technique plays a very important role in coping with common hair problems like dandruff, split ends, dry hair and the most crucial one - ‘‘hair fall'. • Warm oil to a bearable temperature before applying it on your hair. • Make as many partitions of your scalp and start applying oil with your finger tips. Cover each and every portion of the scalp. Once you are done with the scalp, you can apply it on the hair strands. • Massage it with your finger tips at least for 15 minutes. This improves blood circulation and promotes hair growth. • Wrap your hair with a towel dipped in hot water. Keep a blowing hair dryer on the towel so that the warmth inside the towel is intact. • Do this for a minimum of 30-45minutes and shampoo your hair and also condition it. • These hot oil treatments give your hair a shine, glow and restores the moisture of the hair. 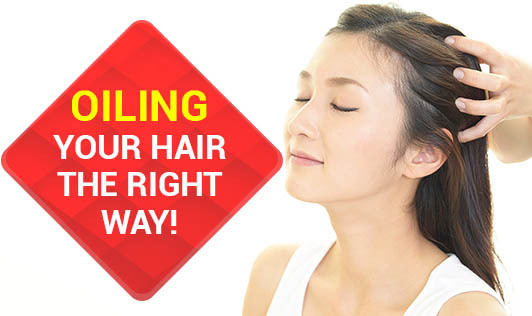 This treatment can also prevent hair fall when done regularly once a week. • Take curry leaves, crush them. Mix in coconut oil and warm the mixture. Apply it on the scalp and wrap the hot towel. The same recipe can be tried with fresh hibiscus flowers also. • Squeeze a lemon into warm coconut oil and apply it on your hair. This mixture will condition your hair and also removes dandruff. • Make a mixture of soybean oil and castor oil in a 1:2 proportion. Warm and apply. • Mix 2 tbsp of olive oil and 1tbsp of honey. Warm this mixture and apply. It is very nourishing and works wonders for your hair. Using this mixture once or twice a month is highly recommended. • Take an equal quantity of olive oil and coconut oil, warm it and massage it on the scalp. Follow the same procedure of hot towel wrap. You can change the oil according to your choice, but make sure that you are not allergic to any oil or any of the ingredients before using them. These treatments are very effective, inexpensive and can be easily done at home. A hot Oil massage is very relaxing and de-stressing. . So pamper yourself with a hot oil massage and relax this weekend!